Combine cardio and strength training with the EFITMENT RW032 Total Motion Rowing Machine. This compact machine (Dimensions: 55L X 13W X 10H) with a slide rail length of 38 inches, is designed for a full body rowing experience, targeting your abs, legs and shoulders. 12 levels of hydraulic adjustable resistance create the tension for an incredible workout. Padded seating, foam grip handles and adjustable Velcro strap pedals provide additional comfort, stability, and safety for fitness enthusiasts of all levels. Experience an unbelievable, low impact rowing workout and track your fitness results on the digital meter with a mobile device bracket. Build stronger muscles with a genuine rowing experience with the total motion rowing machine by EFITMENT. SOLID STEEL FRAME: Heavy duty steel construction holds a max weight capacity of 350 lbs. The large padded seat slides smoothly across the 38 inch slide rail length as your push your legs back for indoor rowing exercises. 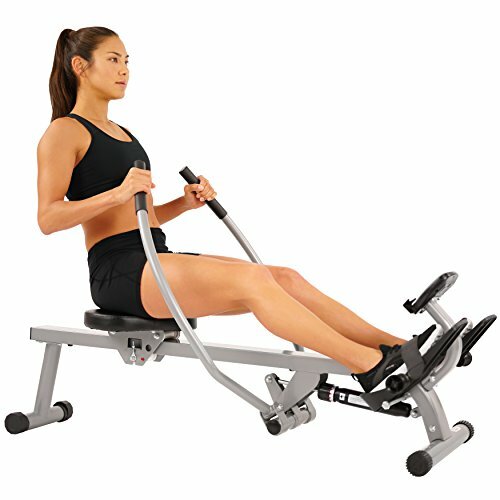 FULL MOTION ROWING: Unlike traditional rowers, this EFITMENT rowing exercise machine is designed for full arm extensions. This mimics authentic rowing movements providing you with a genuine rowing experience. Slip resistant, comfortable handles provide additional control for your rowing exercise. 12 LEVELS OF RESISTANCE: 12 levels of hydraulic cylinder resistance create a versatile home rowing workout. Choose your resistant level and hold onto the slip resistant handle bars for full arm rotations. Engage muscles in your arms, shoulders and back with the cardio rowing machine built for tough workouts. DIGITAL MONITOR: Place your tablet or mobile device on the tablet bracket and follow along your favorite rowing videos. Crush your fitness goals while you track them on the meter displaying time, count, calories burned, total count and RPM. ERGONOMIC FEATURES: The large, anti slip foot pedals come with Velcro adjustable straps that form to your foot and give you the confidence to engage those legs muscles while rowing. The padded seat effortlessly glides across the slide rail and supports you for longer rides.